Isn’t it time to do something a bit out of the ordinary? How about this French Potez 62? I just love it. The Potez 62 was a development from the Potez 54 bomber, and it first flew on January 28, 1935. The fuselage was all wood, and had a composite coating. The wings were also made out of wood, and fabric covered, but it had a leading edge made out of metal. 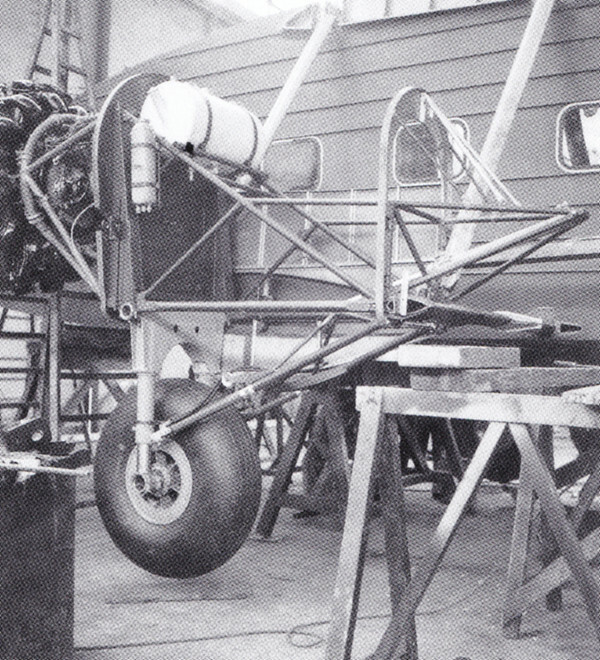 The engines were mounted in two pods, fixed at the fuselage and at the wings. The cabin was divided into two compartments and could accommodate 14 to 16 people. The version equipped with Hispano-Suiza’s V-engines was ordered by Air France in 1936, but I plan to model the original design with radial engines. 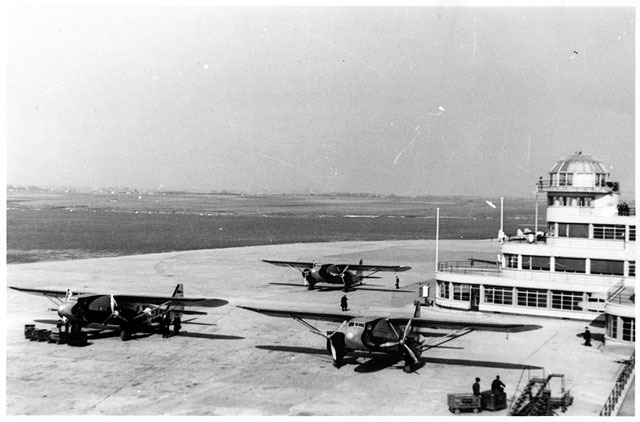 The Potez 62 remained in service until the Second World War, and one of them was used by the Free French Air Force. Engines: 2 × Hispano Suisa V-engines. I just ordered this book by Pierre Dumollard. It should contain everything I need. The book contains this magnificent 3-view. 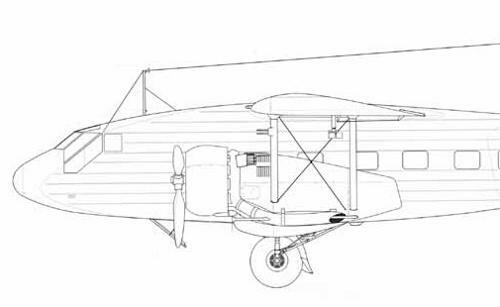 The 3-view lacks drawings of the fuselage formers, but it doesn’t matter – the Potez 62 had a square fuselage, except at the nose. 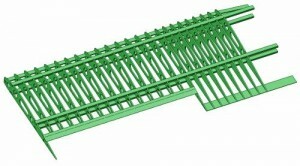 The model will be done to scale 1:10. This is going to be the easiest airplane ever. 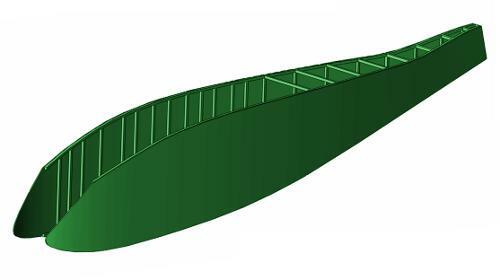 The fuselage has a completely square cross-section, except at the nose and the wings are a candy-bar design similar to those on the Fieseler Fi-167. 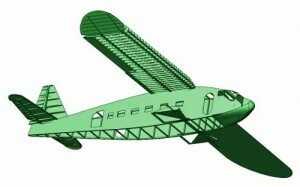 I have decided to construct the model exactly like the real aircraft was constructed, i.e. with a wooden frame and a wooden skin. The only thing that is not flat is the nose cone. I will carve it out of a block of foam, make a plug and then make a fibre-glass nose. I have started on the wing construction. The wings on the real aircraft were constructed from very thin wooden stringers, that could be seen through the canvas covering. I will have to replicate this, and at the same time keep the weight down to a minimum. 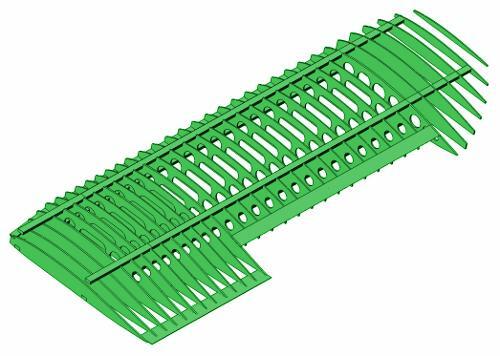 I have decided to construct the ribs from 2 mm balsa with lots of lightning holes, and then use cap-strips to spread the load from the canvas. Of course I will be using 3mm aircraft grade plywood where strength is needed. 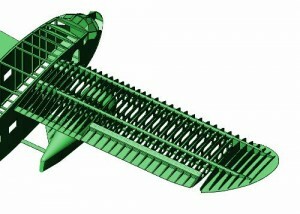 I have also completed the ailerons, but they are not shown here. Anyway, I will press on with the design. Next is the wing tips and the inner part of the wing, which is made from progressively smaller ribs. When all the wood-work is done, I will continue with the aileron servos and the strut attachment points. I have been looking at the Potez wing tip all day today. 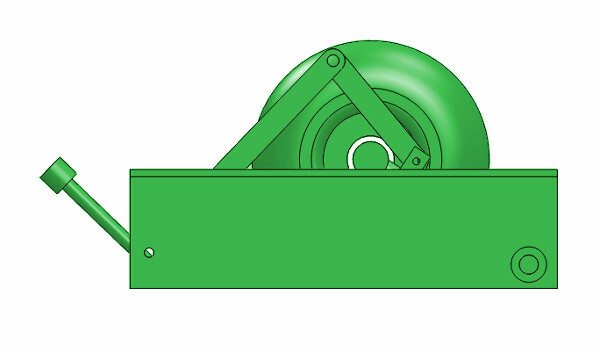 Since it is of a very distinct shape, it proved very difficult to draw it right. In the end I had an epiphany: By looking at the wing tip shape from above, i.e. 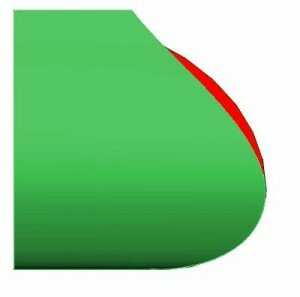 the tip shape on the top view drawing, it is possible to calculate backwards and get the wing rib profile. It is kind of lofting in reverse. This has profound implications, as most 3-views always contain good wing-tip details, but there rarely are any information regarding the wing profile available. On the Fieseler Fi-167 I effortlessly got the correct wing tip shape. It must have meant that I got the wing profile right when I was studying old photos and comparing them to wing profile tables on the net. I just did not pay any attention to it at the time, but I was, in fact, just lucky. Now, on the Potez, the wing tip shape was completely wrong, no matter what I did. In hindsight, it meant that the wing profile I got from the 3-view was totally wrong. I just didn’t realise the connection between wing tip shape and wing profile at the time. 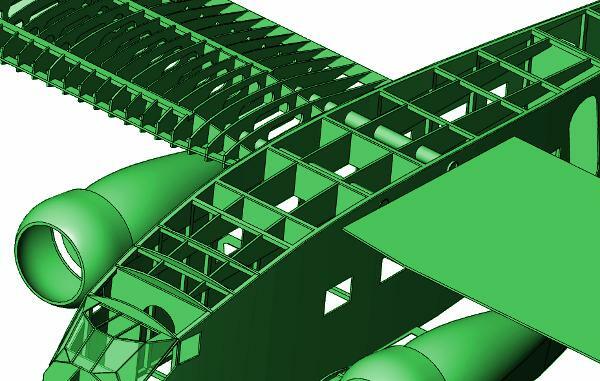 Now that I understand how it all fits together, I will redraw the Potez wing with the correct profile. The exciting bit is that, in the future, being able to calculate the wing profile from the shape of the wing tip, is going to be a really powerful tool, and something I will have to do every time I start on a new model aircraft. According to the book, the Potez 62 used a modified Clark YH wing profile. I have entered a Clark YH airfoil and used it to generate the wing tip, based on my lofting method. 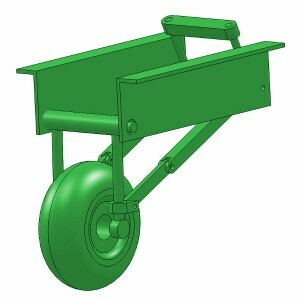 The picture shows the result. 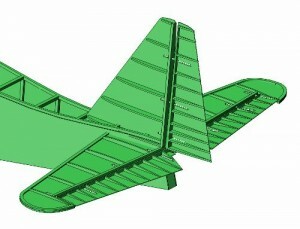 In the picture I have overlaid the generated wing tip (green) with the one drawn on the 3-view (red). The leading part of the wing fits perfectly, while the trailing part is slightly out. Since the wing tip from the 3-view is wider than the one I generated from the Clark YH airfoil, I will have to modify my airfoil until the wing-tips match. 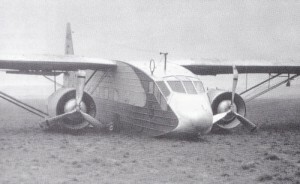 In other words, the wing profile used on the actual Potez 62 was thicker than the standard Clark YH profile at the trailing part of the wing, but otherwise identical. OK, enough wing posts for now – I am done. Now it’s time to round the ailerons, and then on to the elevators and the rudder. The empenage is now taking shape. The original was built from wood, with the fixed parts covered in plywood, and the moving parts covered in canvas. I will of course do the same, except using balsa sheeting instead of plywood. The rudder and the elevators have been completed. 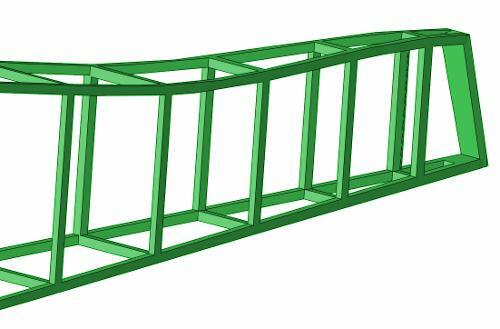 The fixed part of both are to be sheeted by balsa sheeting. The aircraft engines on the Potez 62 were mounted in nacelles under the wings on an array of struts, attached to the wings, fuselage, and a sub-wing. I will copy the struts using piano wire, to get sufficient strength, and the sub-wing will be made from balsa on top of the piano-wires. The Potez 62 3-view from the book is one of the best 3-views I have worked with ever. However, I have encountered a tiny problem with the cockpit windows. On the 3-view the lower edge of the windows are drawn on a straight line, but that’s not actually how they were installed. Luckily the book is full of photos, and it is clear that the 3-view does not tally with the 3-view on this point. 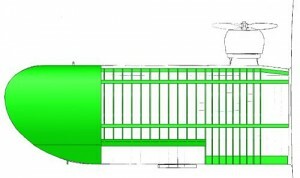 The fuselage longerons on the real aircraft were used as a seat for the elevators. I had overlooked that and had to cut down the aft part of the fuselage. After correcting the 3-view, it was easy to get the front of the aircraft figured out. I will complete it tomorrow. I have cut out the windows and doors in the side sheeting. I have received an e-mail from Mr. Pierre DuMollard, the author of the ultimate book about the Potez 62 that I have been using as my reference when making the model. Pierre has allowed me to draw on his immense knowledge and his huge library on this gorgeous aircraft. Pierre, I can’t thank you enough. Questions will be coming your way soon. 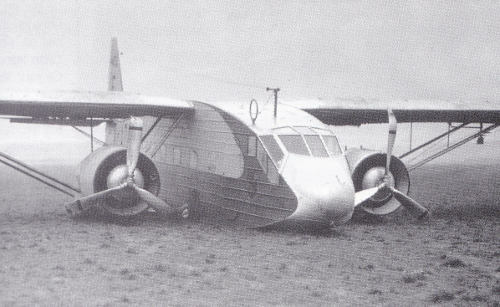 As a side-note, I will try to get him interested in the Farman Jabiru – one of the ugliest aircraft ever made. 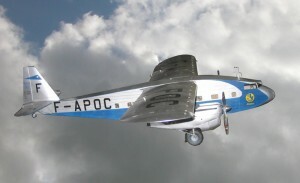 I received an e-mail from Pierre DuMollard, the author of the Potez book. Pierre saw my website, and graciously offered to help me if I get stuck. Now I am going to take him up on the offer – Thank you Pierre. I am having some trouble with the aileron hinges. I have asked him for some detail photos. If they exist, he should have them. 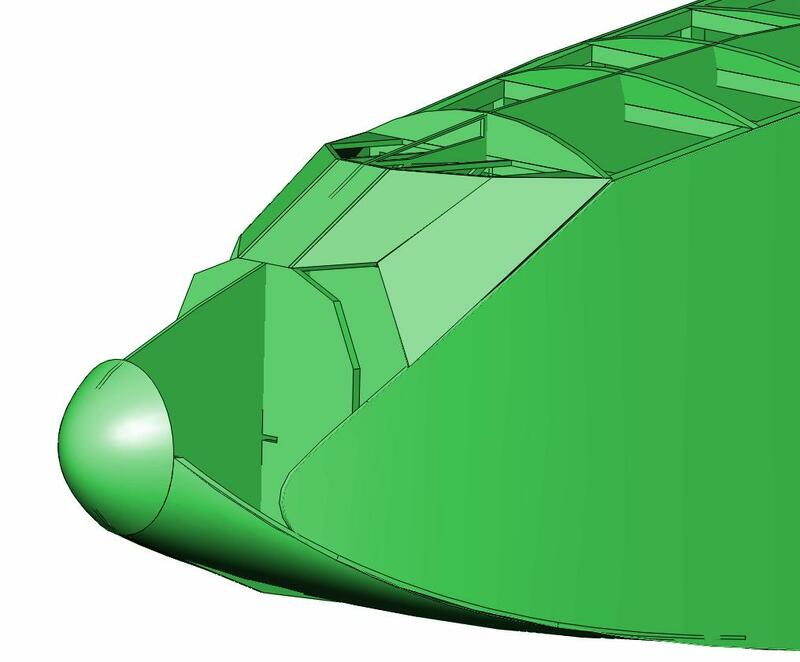 The engine nacelles have a very difficult compound curved shape. I have managed to get the top of the nacelle correct, but the bottom part is playing some tricks on me. Finally! The wing-tip is complete, and I have the modified wing profile. 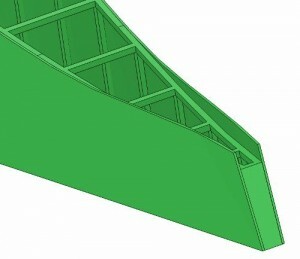 Here is a picture of the wing overlaid on the 3-view. Perfect! Now I can clean up the wing and move on to the elevators and rudder. 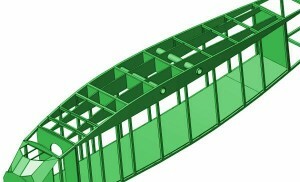 Potez 62 – All wing ribs done. The wing ribs are done. I have spent all day cleaning up the wing. It just takes a really long time. I will finish the wing-tip tomorrow, and then I will be ready to cut some wood. 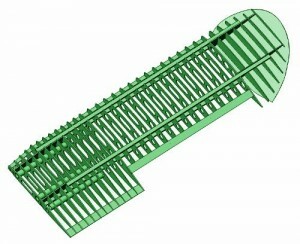 I got a reply from Pierre straight away, with a couple of detailed wing photos. 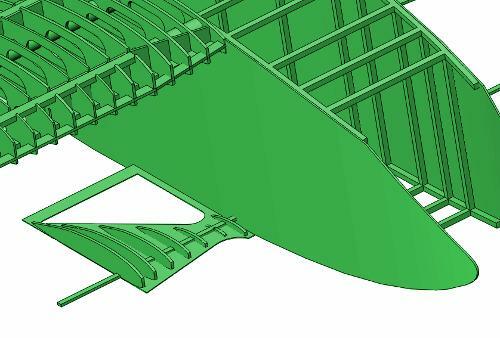 Apart from completing the ailerons, I also found a problem with a missing wing rib. I have now completed the ailerons and indeed the wings. I have seen a model of the Potez 62 at Le Bourget in France. It was not so big, but it looked great. Very good scale outline and many details. Even the colours were perfect. It was behind glass, but I did get a couple of pictures taken of it (complete with reflections in the glass). The Potez 62 is a parasol design, with the engines mounted in nacelles below the wings. This requires a very strong fuselage box and here is how I solved the problem. 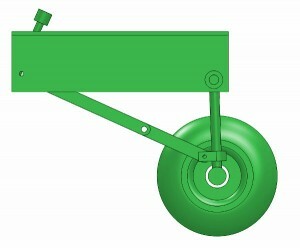 The wings are mounted with aluminium tubes, and I plan to make the struts from metal as well. With the fuselage sides glued in place, it should be strong enough. 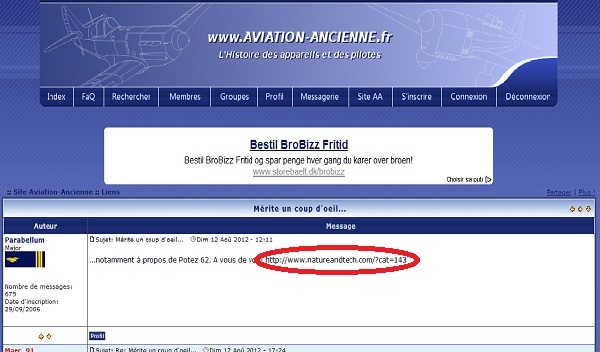 Just as I discovered people in both Italy and the UK are linking to my web-site, the French have linked here as well. I love it! Drew the external longerons today. It’s not really a big deal, but it looks great. I did a quick landing gear test using the geometry from the 3-view. It works great, and locks nicely in the down position. Unfortunately it also lock at the up position, which makes it impossible to get the gears down using a single air cylinder. This can be fixed though. My main concern is that the gear does not fit in the engine pod. Did I draw it wrongly? Found this photo in the book by Mr. Dumollard. It clearly shows that the width of the engine cowl is straight at the landing gears. I will have to fix that in my model. Update fuselage around elevator and rudder attachment area. Cut holes in fuselage sheeting for windows and doors. 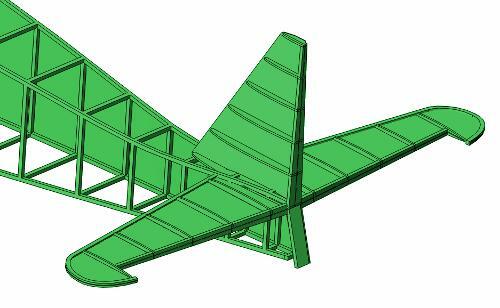 Complete the wings and ailerons.